This page covers advantages and disadvantages of f-OFDM (Filtered OFDM) technique. It mentions f-OFDM advantages or benefits and f-OFDM disadvantages or drawbacks. The term f-OFDM stands for Filtered OFDM (Orthogonal Frequency Division Multiplexing). As mentioned f-OFDM is the short form of Filtered Orthogonal Frequency Division Multiplexing. It is variation to conventional OFDM technique. The figure-1 depicts use of filtering algorithm after IFFT/CP module in normal OFDM transmit chain. Refer difference between OFDM Vs f-OFDM >>. ➨It suppresses Out Of Band Emission and hence guard band consumption can be reduced to minimum level. ➨Optimized numerology can be applied to suit the needs of certain type of services within each sub-bands. ➨Possibility to incorporate other waveforms such as GFDM, FBMC, UFMC etc. ➨Using sub-band based filtering, global synchronization requirement is being relaxed. Hence inter-sub-band asynchronous transmission can be supported. ➨The f-OFDM requires additional pair of transmit and receiver filters in transmitter and receiver chain respectively compare to conventional OFDM. ➨Like OFDM, CP can also be used in filter-based waveforms such as UFMC, F-OFDM to protect signal from ISI. 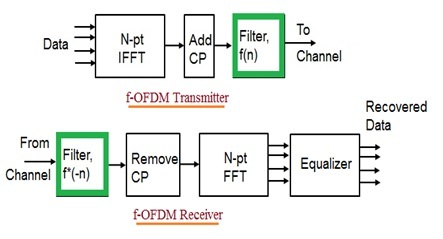 ➨Since full-band filtering can not remove any ICI, it exists in f-OFDM similar to standard OFDM. Conclusion: The f-OFDM can overcome the drawbacks of OFDM technique while retaining its benefits. It is used in 5G technology due to overall performance, associated moderate complexity, cost and smoothness. OFDM Preamble generation Time off estimation and correction Frequency offset estimation and correction channel estimation and equalization.